We carry a full line of towing accessories to get you on the road safely and legally. Made of rugged PVC our premium light bar won't rust or rattle and scratch the chrome. 60" long this unit is completely weatherproof featuring sealed beam lights, flush mount 7-way socket and reflectors. Includes 4 u-bolts and bungie straps for mounting to the towed vehicle. 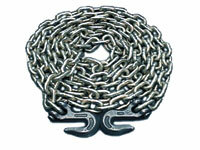 Towing and safety chains for secure and safe hookups. The above items are the basic needs for most hookups. If you need any items not listed here just ask and we can get it for you . Copyright © 2013 Tow Your Own All rights reserved.